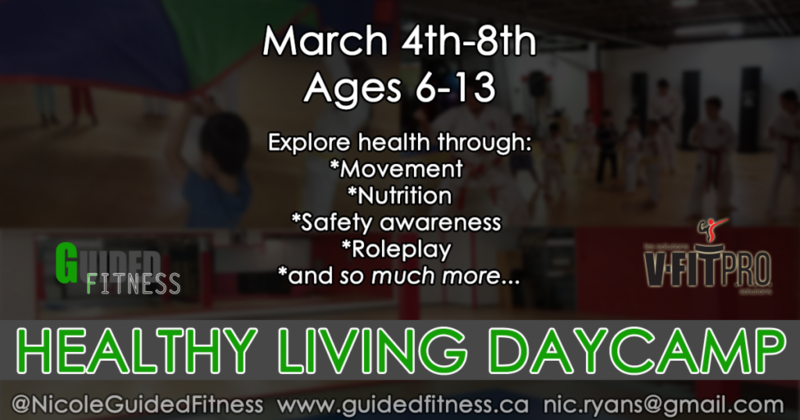 Healthy Living Daycamp is now open for registration. It is a great opportunity for children between 6 and 13 years old to learn ways to make their health a priority. With a focus on exercise and nutrition, this March Break Daycamp is unique in the Montreal West area. The camp will run from 08h30 until 16h00 everyday. Before and after camp childcare is available, at an extra cost. Children will learn why it is so important to move throughout the day, and what benefits exercise offers them. Body awareness at any age is important, we believe that through the practice of various activities, children will learn not only the benefits of movement but will also gain knowledge about their bodies, how they move, reach, balance and more… We will learn how and why we read food labels, what impact that might have on your day, picking the right foods, moderation in choosing a sweet or salty morsel. We will be covering age appropriate self defense training. Using roleplay and training, children will explore various situations and see how they respond and what they could have done. Please fill in the following form and someone will get back to you either via email or phone. Thank you! Let us know if they are coming for the whole week. 7:30 pm – 8:30 pm, April 24, 2019 – POUND - Rockout. Workout.